I spent the bulk of Easter Sunday and Monday on my own, with Matt working 12 hour day shifts and my kids still away. My Easter indulgence consisted of a couple of squares of Lindt 85% cocoa chocolate. Sunday was taken up almost entirely by sleeping in (aka going back to bed after getting up to do the milking), the sourdough bake and dealing with the apples. One pleasant side-effect of doing the sourdough bake when I am home alone on a weekend is that I get to make pancakes with the excess starter. Sourdough pancakes with banana, walnut and maple syrup for breakfast. Nom nom nom. 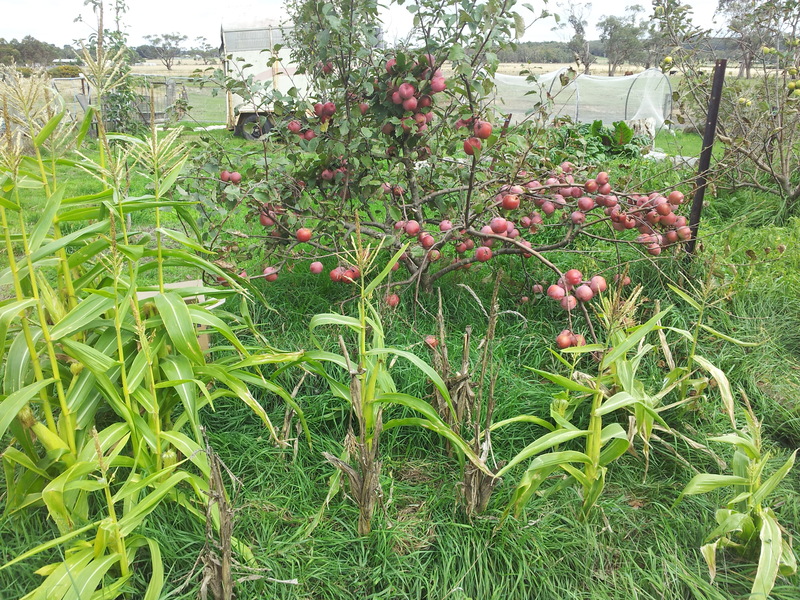 As for the apples… I stripped the Golden Delicious tree last weekend since I needed 1kg for the chutney I made with the beautiful big red tomatoes I was given by the boys’ grandparents. For my first go at chutney I was pretty pleased with the result. It is a great combination of sweet and savoury, and it went really well with the sausage rolls I made from Silkie meat and sweet potato. 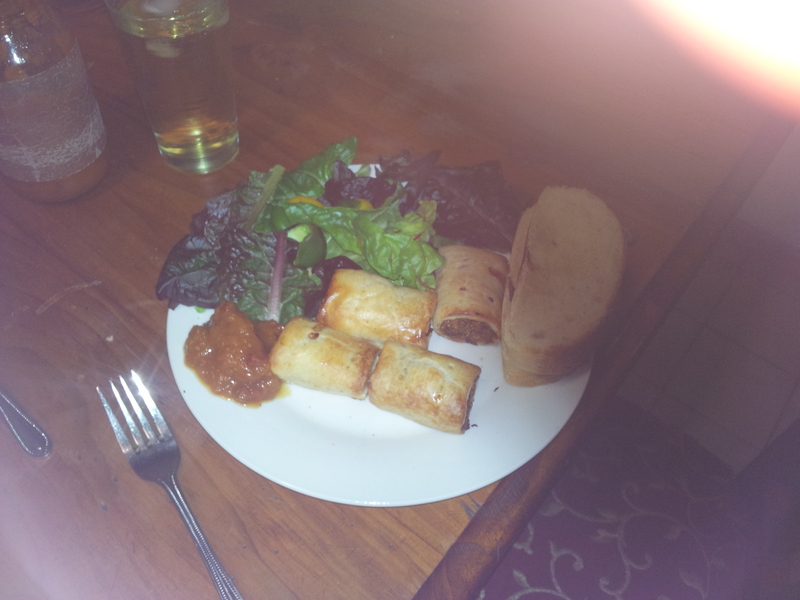 Sunday dinner – sourdough bread, Silkie and sweet potato sausage rolls, mixed greens and chutney. I only have three apple trees, and I heard a lot of reports from other backyard producers that due to the extreme heat this summer the crops had been poor. I netted my trees this season to keep the birds off them, and I must admit that my success was mixed. 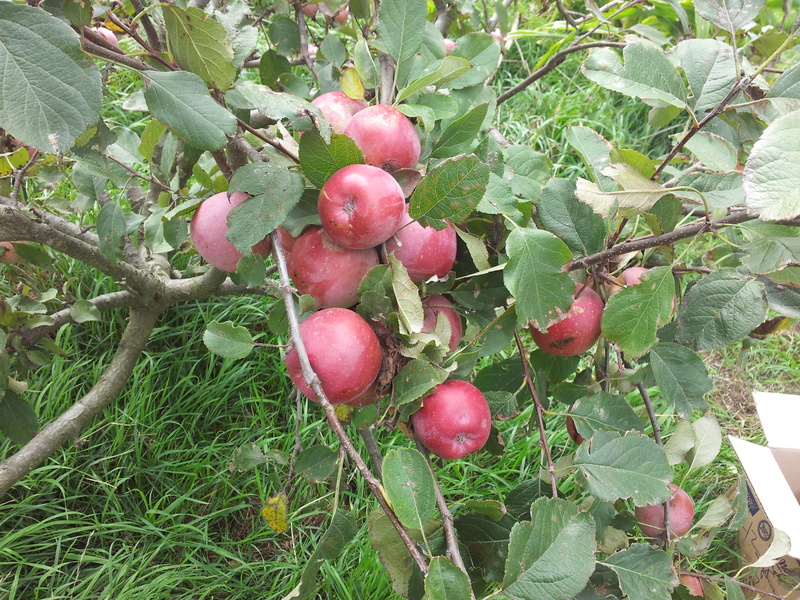 The Jonathan tree, usually my best producer, gave a good number of apples, but they were tiny. I pruned it savagely over winter, and probably should have thinned the fruit early on. The Golden Delicious tree has never looked totally happy. I was a bit soft in my approach to pruning this one, as it is still recovering from being pruned almost to death by a goat a few years ago. 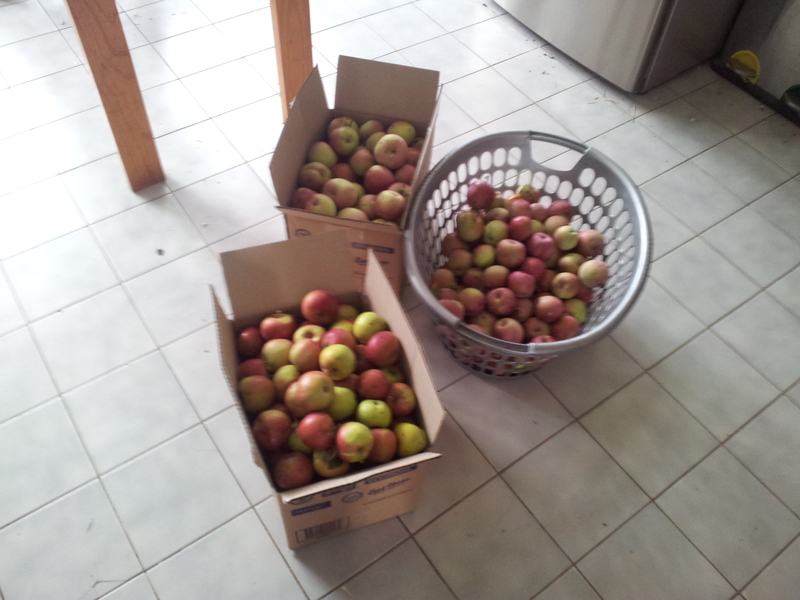 I got some nice apples of a good size, but as usual not a huge yield. I am not completely sure what variety my third tree is, but I think it might be a Fuji. It usually gives a small number of sweet but small apples. This year it really proved its worth. My third apple tree, full of fruit. Not only were the apples a good size, there were plenty of them. I got a box in total from the Jonathan and Gold Del. From this tree I filled a second box and had to go back for the washing basket to bring the rest in. I put about 20 apples into preserving jars for winter puddings (hooray for my $22 peeler/slicer/corer), filled two of my fruit stand baskets with the pick of the crop and set to work juicing the rest for cider. I was given a juicer by a friend who was moving house several years ago. Sure, it makes great juice, but it is a pain to clean. It is a tough and efficient machine in other ways, and it whizzed through all those apples like a champ. I ended up with 12.5litres of juice and a big bucket of pulp. The poultry greatly appreciated the pulp. I had to warm the juice slightly to dissolve the sugar, which helped get it to brewing temperature. 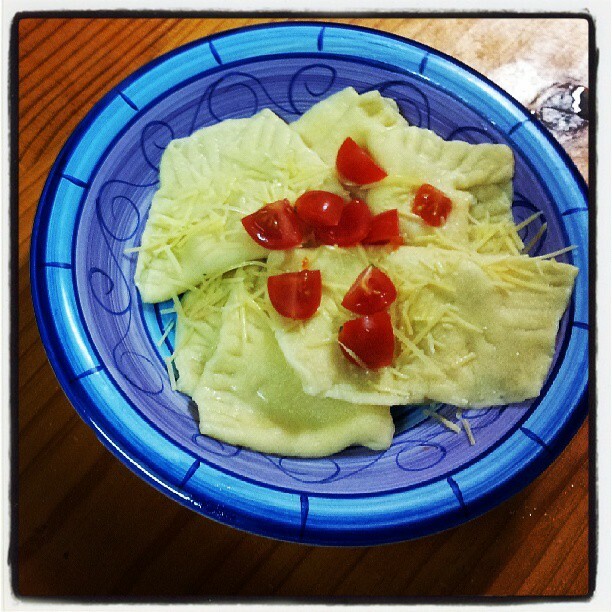 I added the yeast sachet that I got from The Home Brew Shop in Ballarat. Then I parked the whole thing on the heat pad in the small bathroom. Two days later it is fermenting very happily at 24 degrees. I have never made cider from actual apples before. Until now I have used canned apple juice concentrate, so this batch will be very interesting. Hopefully as long as I manage to keep it warm enough for long enough after bottling it will have the dryness and champagne-like fizz that I enjoy so much. I’m not quite ready for that yet. Once I stopped moving forward I slipped into a guilt spiral. All those things I ‘should’ have done instead rolled around and around in my mind. I ended up curled up in bed with the doona over my head. Yay me. Nothing that I didn’t do was especially pressing. But when I make a To Do list you can bet your tail that I will damn well do all the things on it. And I won’t be happy until I do. I especially won’t feel that I deserve to sit down until EVERYTHING is done. For those who bear witness to all the things I do, all the things I achieve, I rarely reveal the flip side. I put enormous pressure on myself to do all these things. Don’t get me wrong, I do enjoy what I do. Sometimes, though, I find completing the task to be more rewarding than performing the task. That is, I am not happy while doing, only when done. Which is not a recipe for happiness. I am working on being more present, on seeing life as more than a list of tasks on a whiteboard that I have to cross off. A night of cooking is one of my favourite things, especially with the addition of music, someone to talk to and something nice to eat and drink. But some days the To Do list is all that keeps me going and I am almost afraid to stop. It keeps my brain on the straight and narrow and while I am busy, while I am doing things, it has no right to judge me. Apparently we all need down time. What I have to do is realise that I deserve it.